This Maintenance-of-Way (MoW) Section Tool House was constructed circa 1895. The tool house is constructed with heart redwood lumber and was originally located next to the mainline track, north of the Brokaw Road easement. The tool house was moved back about sixty feet to its current location, sometime between 1908 and 1918. The tool house measures 12’ wide by 16’ deep. 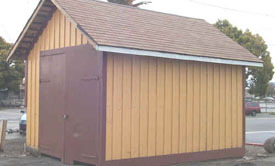 From its construction until 1958, the Section Tool House was used as a tool storage building and a base for the Santa Clara MoW section gang (5 persons). From 1895 to 1926, the section handcar was also housed in the structure. Wood runners ran from the tool house to the track to facilitate the movement of the handcar. In 1958, Southern Pacific abolished the concept of MoW section gangs and created “district roving” crews. By 1960, partially due to their general age and deterioration, and tax liability, many former section tool houses had been demolished. The Santa Clara MoW section tool house survived because the SP Signal Department used it for storage. In 1970, an extension was built on the west wall. 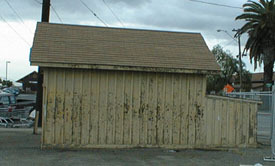 The tool house was used to store the SP Signal Maintainer’s company vehicle from 1970 to 1993. In 1993, responsibility for the tool house was given to the SBHRS.